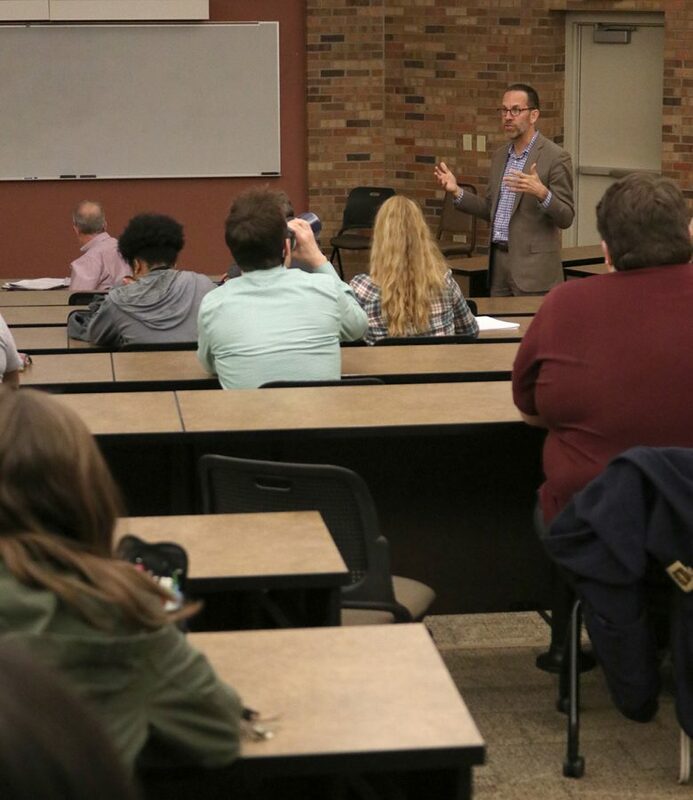 To discuss the new renovations being done to Moffett Library, Douglas Moss, partner to Holzman Moss Bottino Architecture, administered a presentation during the Student Government Association meeting March 6 in Dillard Room 101. Moss said that the construction will begin in May and will continue for about a year, coming to an end the September of 2019. The interior renovations will include new carpet, paint and furniture equipped with outlets and eleven pod study rooms. Renovations will also be done to the two elevators in the library. Moss said one of which doesn’t meet any elevator regulations known to mankind, it doesn’t even reach the third floor. As a result they are installing a new elevator. Due to much of the central space being taken up by furniture and pod rooms, computers and books will be kept to a minimum. However, Moss said he is confident there will still be an adequate number of both. “We been working really hard with the library staff to make sure that we still have the right amount of periodicals, the right amount of reference material and a right amount of the [book] collections. They [the library staff] feels very comfortable it [the renovation] will have no kind of negative impact on the number of books and the amount of bookshelves required on the campus,” Moss said. Bathroom renovations are also being made to the library starting this summer. “By September, when school starts again, all six restrooms will be completely renovated. New toilets, new stalls, new wall finishes, everything. Then two new unisex toilets on the first floor,” Moss said. A steering committee was created by the university to be in charge of the final renovation designs. To make sure the money invested keeps it’s worth and to preserve the renovations being made, they have been very careful in the type of materials being selected. “We’ve been really careful in the type of materials being selected, the colors that we are selecting and the durability of things like the carpet and the furniture,” Moss said. 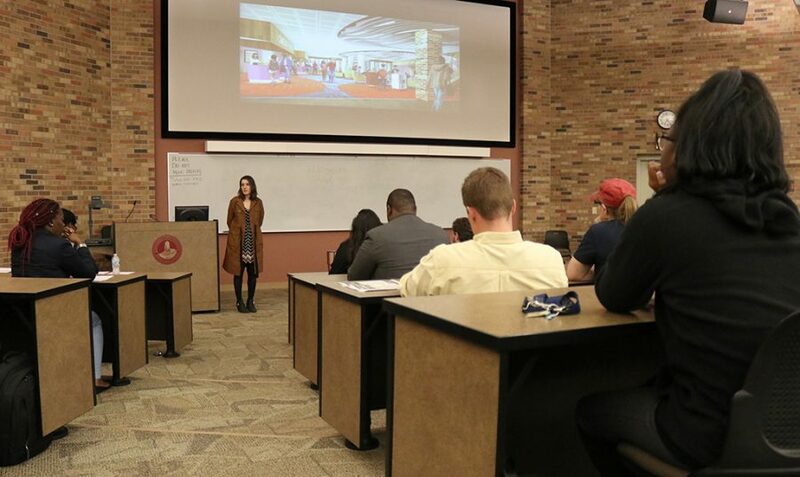 Maria Peña, SGA president, said based upon what she had seen in the plan and the powerpoint presented by Moss, there was nothing stating Midwestern State University or MSU Texas. Peña said the university now has two major marketing logos one for branding and the other for media. “My concern was that they just add that somewhere to separate us from just being a public library or just a regular library in general,” Peña said. Deshaunte Rolle, biology senior, said she approved of the renovations presented by Moss. J’Anne Robinson, nursing sophomore, also said she was looking forward to the changes being made. “I like that they are making it more open and invited for students. Overall, I like the design , the color, and the furniture,” Robinson. 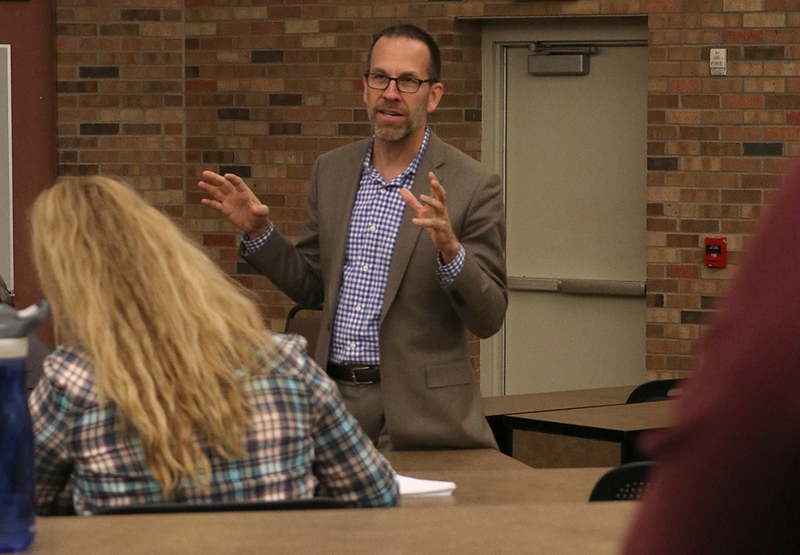 Kick-starting elections on campus, Dr. Duff, political science professor, will be hosting a debate in Bolin 100 March 7 at 7 p.m.
To participate in THOR, a 5k marathon benefiting the Wichita Falls Stream and Valleys, contact Jacob Warren, SGA publicity chair. The race begins April 7 in Lucy Park at 8:50 a.m. Tickets are on sale for $10 and 14 spots are still avialable. After the passing of Dr. Yoshi Fukawawa, professor of economics, SGA passed a bill to establish a memorial in the form of a plaque to honor his 40 years of service for the university. Another bill was passed to establish a Room 173 in the Clark Student Center to be designated for a food pantry available to registers students in need. Sponsored by SGA, a student discount card project by spring 2019 for the price of $10. The discount car will allow students to get discounts on drinks and appetizers at approximately 30-40 businesses.